Dartmoor is renown as being a wet place but the water levels are not deep enough to submerge a submarine so why should there be a page on the Dartmoor ‘Submarine’ and why is it included in the Ancient Monuments category? On a clear day stand on any high promontory on the south moor and look towards the south-west and part of the answer will become obvious. Because perched on the crest of a hilltop will be what appears to be the coning tower of a submarine – I could use another similarity but I won’t. 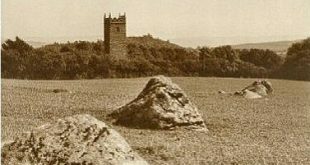 Hemery describes this feature as the, “Sentinel of the Avon,” and as being, “one of Dartmoor’s most notable landmarks,” p.296. The recognised name for this landmark is Eastern Whittabarrow or as the Ordnance Survey like to call it – “Eastern White Barrow.” The photograph below clearly demonstrates why in modern times it has earned a couple of alternative names, one being the ‘Submarine’. and the other the ‘Cottage Loaf’. The photograph below clearly shows why these fanciful names came about. Ok, so what is Eastern Whittabarrow? Originally this was a Bronze Age cairn and at a later date has been enlarged and modified with the addition of the tower. Hemery, notes that when William Crossing measured the cairn he found it to be “270 ft in circumference and thirty-six feet in height,” p.296. However, Crossing’s exact words are, “Eastern Whittaburrow measures 90 yards in circumference at its base, and 12 yards from base to summit,” p.35. So what is the problem? Basically, Butler clearly states that the height of the cairn is, “made even more prominent by the addition of the peculiarly shaped little tower to its summit adding a further 2m to its height of 4m (13ft),” p.159. This means that either the cairn has lost about 23ft in about 100 years or Hemery mis-read Crossing who clearly meant from the edge of the cairn (“base”) to the top of the tower. How else apart from dismantling the cairn could an accurate height measurement be taken in the early 1900’s? Just to confuse matters even more, tradition and Brewer, p.29, consider that the tower was built by some South Brent children in 1930 which was after Crossing took his measurements. As previously mentioned the ‘submarine’ is visible from a considerable distance and standing at an altitude of 1,544ft (470.6m) it is hardly surprising. The 3D map below shows the cairn standing high above the head of the Avon Dam which obviously would not originally been there. The whole ridge is dotted with smaller cairns which includes Western Whittabarrow which stands about half a mile (100m) away. The other claim to fame for Eastern Whittabarrow is that it has been used as a point on both the 1240 and 1609 perambulations of the forest of Dartmoor. In 1240 the translation of the perambulation goes, “so in line to Ester Whyteburghe.” However, some confusion appears in the 1609 and the culprit is a Latin phrase, namely, “ulter Whittabarrow,” does this refer to Eastern or Western Whittabarrow? The abbreviation ulrem is an early medieval abbreviation of ulteriorem which Gooder, p.168 translates as “farther, on the farther side, beyond.” But depending on which way you approach the Whittabarrows, either could be regarded as, “on the father side or beyond.” The Duchy decided that it referred to Eastern Whittabarrow and following every survey to this day they maintain that belief, coincidentally by reading the bounds thus it encompasses more land within the forest bounds? But the Ordnance Survey take the opposite view and consider Western Whittabarrow to be the correct marker. Brewer, D. 2002 Dartmoor Boundary Markers, Halsgrove Pub. Tiverton. Butler, J. 1993 Dartmoor Atlas of Antiquities. Vol. 4, Devon Books, Exeter. Crossing, W. 1987 Stones of Dartmoor, Quay Publications, Brixham. Gooder, E. A. 1978 Latin for Local History, Longman, London.